In my head, my future with baking hitched itself to my future with this kitchen, and I fought hard. I debated with my girlfriends the entire ride back, pleaded for a few more days, then finally, reluctantly, agreed to drop it. We continued looking for another month. Then one of my friends bowed out due to financial reasons. April loomed and I panicked when the on-campus housing deadline approached. At the last minute I requested a single room in a six-person suite, locking in a junior year of dorm life. Disappointment steeped through me like bitter tea, hot and lingering. But then finals were around the corner, and then one by one my friends said goodbye, and when the semester ended I’d stopped thinking about a kitchen of my own. Now I’m home for the summer. Away from Boston, I’m finally realizing how stressed out I was. Stressed out by work and the looming prospect of My Future. By my friends, and by my parents – my relationship with them is evolving faster than I can keep up. Somewhere along the way, responsibility and anxiety squeezed out the last of my creativity. I wish it hadn’t. But then this week, just as quietly as it snuck in, my writer’s block packed up and left. I’m walking on tiptoes, hoping it’s gone for good. It’s taken me a few days to write this post, but I want to be here. After I started writing, I started brainstorming. I rummaged through our pantry and emptied out the fridge, possibilities unfolding. 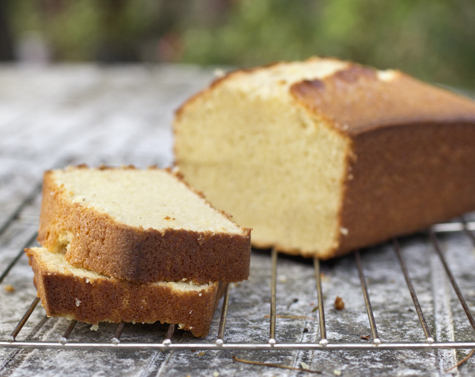 I was drawn to this recipe because I liked the idea of a simple dessert (what could be more classic than pound cake?) with a twist – the addition of sweetened condensed milk, a lot of it. 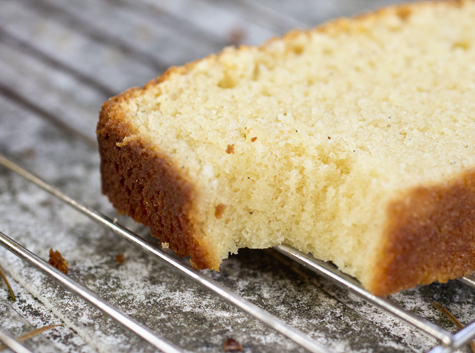 The result is a moist, vanilla-studded cake, densely crumbed and uniquely sweetened. Adaptable enough to serve with macerated strawberries or a curl of ice cream, intriguing enough to eat plain. It’s enough to pull me back into the kitchen again. Three quarters of a cup of sweetened condensed milk? My first concern was that the pound cake would be too sugary, but the condensed milk made the loaf unbelievably moist and dense. The result was sweet enough that I didn’t need icing, but it wasn’t cloying. Three days later the cake was still soft and tender. We have a winner! I added the cognac to balance the sweetness and it ended up lending an interesting flavor. It could be left out, but I’d recommend trying it. Preheat the oven to 325 degrees F. Butter an 8.5 x 4.5″ loaf pan and set aside. Add the butter and salt and process until light and fluffy, about 2 minutes, scraping down the sides and bottom of the bottom occasionally. Add the condensed milk and pulse until well incorporated, about 15 times, scraping down the sides of the bowl once. Add the sifted dry ingredients and pulse until no traces of flour remain, about 10 times. Add the eggs and pulse just until combined, about 5 times. Scrape down the sides and bottom of the bowl, add the vanilla extract, if using, and finish mixing by hand to fully incorporate the eggs. Scrape the batter into the prepared loaf pan. Bake until deep golden brown and a tester inserted in the center comes out clean, about 60 minutes. 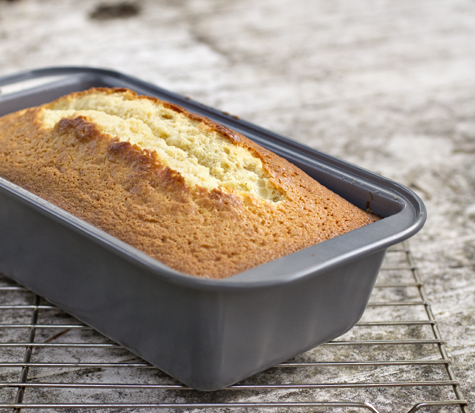 Cool completely in the loaf pan on a rack, then turn out onto a plate. Serve in thick slices. Entry filed under: Cake/Cupcakes. Tags: cake, loaf cake, pound cake, sweetened condensed milk, vanilla, vanilla bean. I’m sorry to hear about the apartment, but maybe it just wasn’t meant to be. And the fifty work week is crazy. You have steel-willed determination is all I can say. 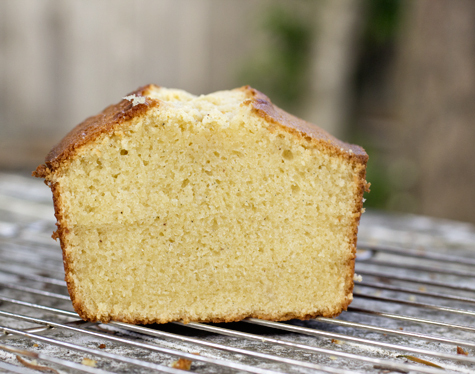 Your condensed milk pound cake is gorgeous. It looks so incredibly rich and dense. I can’t wait to try it. Thank you for sharing your stories with us. As a a rising high school senior, I really enjoy reading your posts about college life. oh! this sounds delectable. you had me at condensed milk! The cake looks lovely! And I enjoy having you back. I miss your writing. I hope you have a lovely summer and a good junior year. Congratulations on the internship. Glad you’re back! We have missed you! The cake looks wonderful! 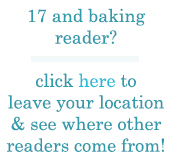 Enjoyed reading your post and love the sound of this cake – I am a die hard condensed milk fan! You’re such a great writer. I’ve been subject to certain blogs from people who aspire to be writers and their prose really just falls flat, but you are just awesome. A “curl” of ice cream?! Who could think of that? I love it. I relate to so much of what you write here. I just graduated college and it’s sad how much cooking can just get curbed in that lifestyle. And I also think 80% of the draw of any new apartment or house is a kitchen I could see myself in. For what it’s worth, I miss your blog posts and hope you’ll have a few more before school sets in again! So so glad you’re back – you should write a general blog to go along with your work here, as you may not always have access to a kitchen, but why let it stop you from posting!! I love your food and passion for it, but above that I just love your writing! Hey! Another college food blogger here, so I thought I’d introduce myself. This cake looks really dense and delicious – and I’d definitely add cognac as well. PS – you have a great way with words, which I completely appreciate. 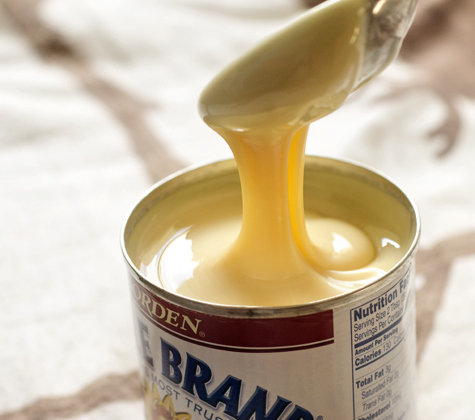 LOVE condensed milk. I think its underutilized in the US. Great recipe. I’m definitely ejoying your blog and look forward tto new posts. material, all your points of view are actually fairly radical. subscribe to your whole theory, all be it stimulating none the less. need to give this recipe a go! thanks! Love to try this with milk shake!